You can see why Microsoft’s Surface Book is ticking off other PC vendors. Microsoft’s stunning laptop, gives you everything you want—showing up all the vendors who said it couldn’t be done. Our review bears that out. Want a true laptop experience that doesn’t compromise? The Surface Book does it in an attention-catching fashion. Want to detach your monitor and use it as a gorgeous, perfectly proportioned tablet with pen support so beautiful it’ll have you sobbing? The Surface Book does that, too. Stupid-long battery life? Yup. And if you want a real graphics chip in an ultrathin chassis—something every other computer maker says couldn’t be done—yeah, Surface Book’s got that too. For this review, we had access to two Surface Books. The first featured an Intel dual-core Skylake Core i5-6300U, 8GB of LPDDR3 in dual-channel mode and a 512GB M.2 PCIe SSD drive and integrated graphics only. The second Surface Book had the real deal: A dual-core Skylake Core i7-6600U, 16GB of LPDDR3 and the Nvidia graphics chip under the keyboard. The hinge on the Surface Book isn’t done for pure bling. Microsoft says it keeps the entire laptop from flopping over. 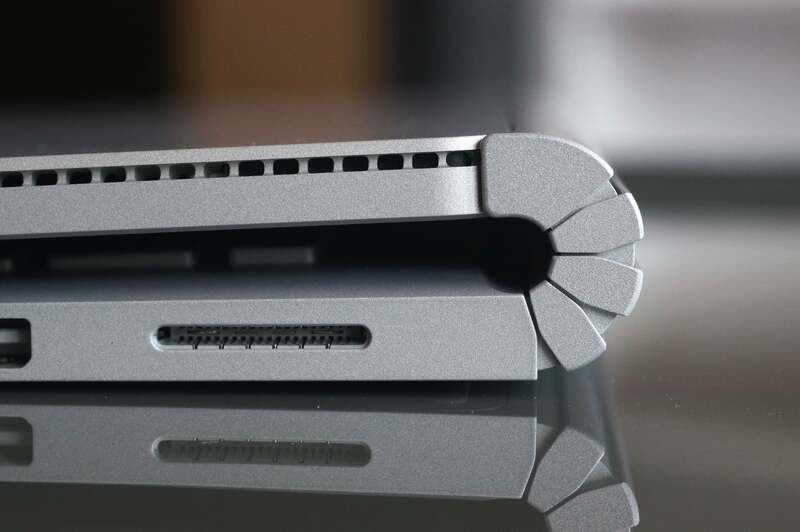 Of course, the most striking feature of the Surface Book is its dynamic fulcrum hinge. It’s a little reminiscent of the watchband hinge Lenovo uses on the just-announced Yoga 900, but a lot beefier looking. 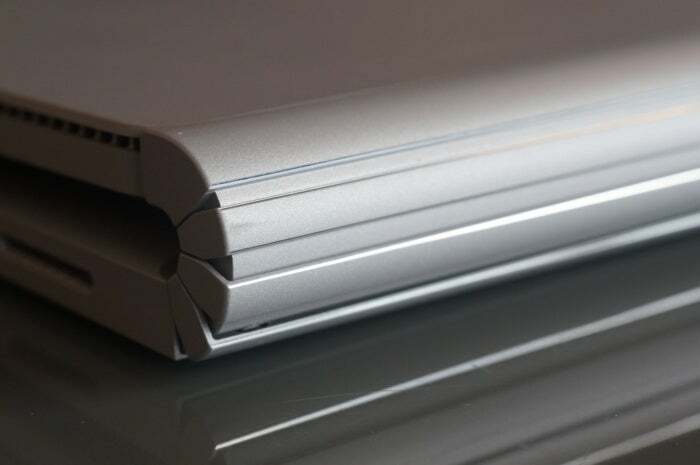 Open the lid on the Surface Book, and the hinge unrolls. Microsoft says the unique mechanism allowed the company to balance the heavy display, which Microsoft calls the Clipboard, without upending the keyboard base. Other designs I’ve seen keep the laptop from flopping back on its head by tilting the keyboard up when open. The hinge is fairly stiff. Trying to bend it without the Clipboard attached will take some strong hands. With the Clipboard attached, it’s stiff enough that you can make fairly precise screen angle adjustments. There is a little bit of screen flop that isn’t present, on say, HP’s Spectre X360, or Dell’s XPS 13. But to be fair, the screen in this case is a lot heavier because it’s a fully functioning computer. Here’s another difference: With other 2-in-1 detachables, you unhook the tablet from the keyboard with a plastic button or slider, and yank it off. With the Surface Book, you press a dedicated button on the keyboard for a few seconds. Inside the machine, you’ll hear and feel a clunk, then you just lift it off. Microsoft calls this a Dynamic Fulcrum Hinge. Couldn’t Microsoft have just used a conventional latch? Probably, but like the joke from Office Space goes, “People want atmosphere and attitude, that’s what the pieces of flair are about.” And the Muscle Wire Lock is definitely a piece of flair. It uses an electrically charged nickel titanium alloy wire called Nitonal that can change shape and then snap back based on the electricity applied to it. The Muscle Wire Lock clamps tightly. Even trying to rip it off (and I tried) won’t budge it. There’s also a little intelligence to it. With the Clipboard battery dead, I re-attached it to the charged base unit. When I tried to remove it immediately afterward, the Surface Book pulled a HAL and wouldn’t open the pod bay doors. Once the Clipboard had enough juice, a few minutes later, it relented. The Clipboard also won’t flop off when the Surface Book’s batteries are completely drained (I tried that too). If you’re thinking these are just nifty parlor tricks to dress up the same old laptop parts, hang on. 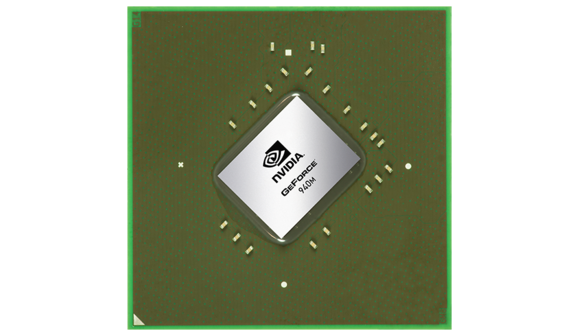 It’s a good bet the GPU in the Surface Book is a variant of this chip. So you probably already know the Clipboard is a complete PC with a dual-core Skylake CPU, RAM and storage inside (more on the particular specs later). Cramming all that into the thermal constraints of an 8mm-thick tablet is an engineering feat. But to get even more performance out of the Surface Book, Microsoft decided to embed a custom Nvidia GeForce GPU in the keyboard base. When docked, you get the power of a discrete GPU. When in Clipboard mode, you get Intel’s integrated graphics. 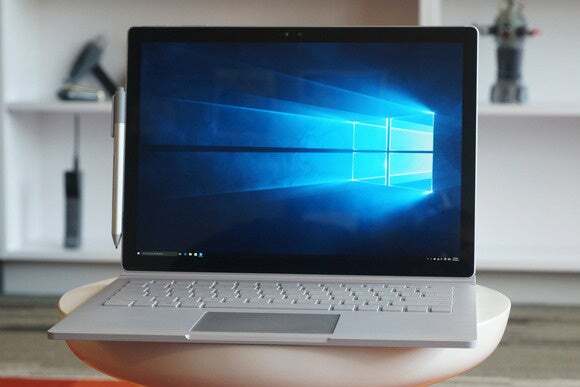 In another first, the Surface Book allows you to separate the Clipboard from the base while the device is still powered on and with the OS fully operational. Details of how Microsoft did this haven’t been disclosed, but I’ve heard guesses from OEMs that point to everything from an internal Thunderbolt connection to some proprietary design. My money’s on something Ryan Smith at Anandtech.com mentioned: a little-noticed feature kicking around for years in Nvidia’s Optimus. Optimus is used on most gaming laptops and allows a discrete GPU to run the show in games, or, say, Adobe Premiere Pro. But when in Word or other low-intensity applications, the power-hungry GPU kicks off and Intel’s integrated graphics takes over to save power. What most don’t remember is that Optimus has supported the hot-swapping of GPUs since the beginning. In this demo on Youtube posted in 2010, Nvidia engineers even demonstrate how it would work. A few vendors have implemented external graphics in a laptop, but no PC maker I know of has integrated the GPU into a separate part of the laptop. This approach is fairly ingenious, because it allows Microsoft to spread the hotter parts between the volume of both pieces. Read on to find out what happens when you plug a Surface Book without graphics into one with graphics. Does it melt? 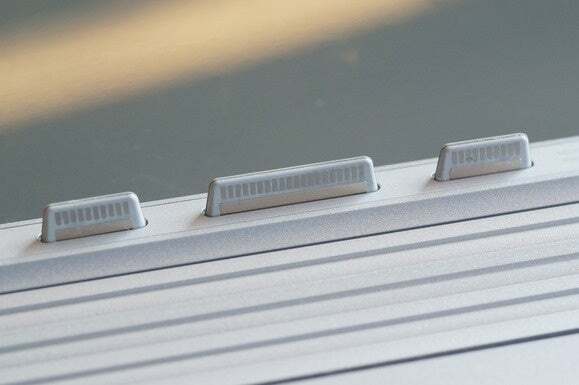 This is how the Surface Book’s base connects power and graphics to the Clipboard section. Microsoft's Surface Book reboots what you'll think a laptop should be.